I would like to produce a detailed report for the Raid 2020 committee about the run, but have not yet done much. 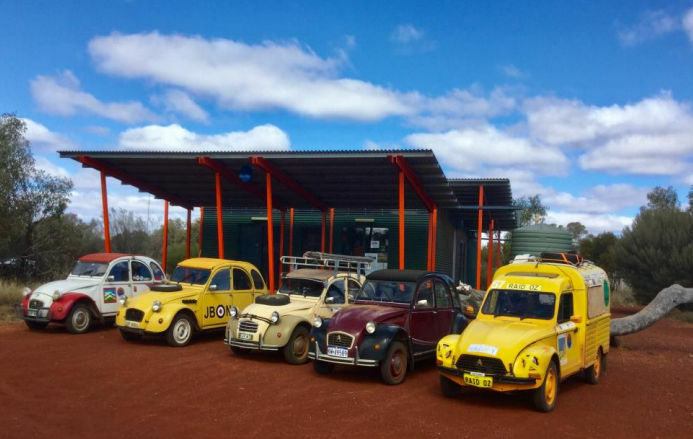 I guess my only excuse is that I have spent quite a lot of time doing the crash repairing, painting and reassembling of my 2CV after the altercation with the emu up near Parachilna. Anyway, that work is now largely finished – I am just waiting for a new grille and headlights to finish it off. The Roads – the Western Australia side of the Anne Beadell Highway was generally quite good and appeared to have been graded recently. There was one section of fairly deep sand where 4 out of 5 of the 2CVs got bogged and had to be pushed or towed through. Ralph’s Acadiane was the only one to get through unaided. There may have been individual cars bogged at other places, but nothing involving more than one car at a time. The roads varied from sand to corrugations to gravel and some rocky sections. The South Australia section was rougher, with a lot more corrugated sections, but nothing that a good 2CV couldn’t handle. The Weather – It rained on a couple of days and some nights were quite cold, but the weather during the days was mostly fine and warm. It was the sort of weather you would expect in the desert in August in Australia. Some days were over 20 degrees. It was all quite suitable for a Raid. You just need a good sleeping bag rated to about – 7 degrees. We had camp fires every night in the bush and so cold was not much of an issue. Fuel, Water etc. – The only place where fuel was available on the Anne Beadell Highway was at Ilkurlka Roadhouse (about 500 km from Laverton and about 800 km from Coober Pedy). Water, some food and showers were available at Ilkurlka. Fuel was $3.50 per litre for Opal which I think is only 91 octane. I calculated that I needed to carry an extra 40 L of fuel after Ilkurlka and I think I probably would have made it okay on this section had it not been for the fact that my (plastic) fuel line along the chassis cracked twice. Fortunately Carolyn Loos was carrying spare fuel in her 4WD and lent me some to get through. 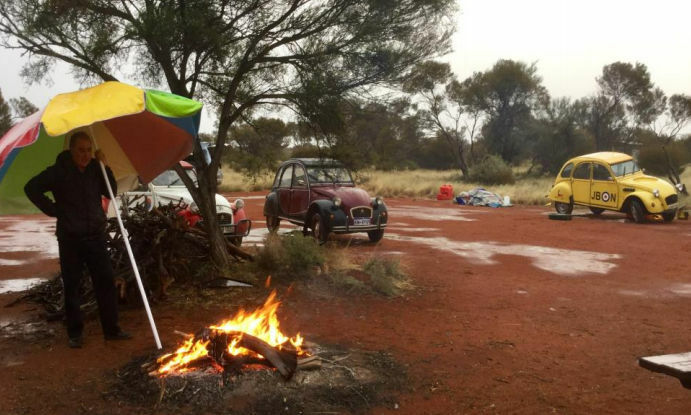 Permits – We had all the relevant permits (kindly organised by Peter Rasmussen) – 3 aboriginal community permits and one for the Woomera area, although we were never checked at any point to see if we had them. 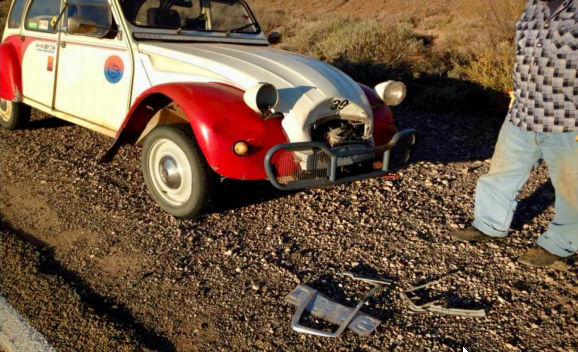 Break Downs – The most significant were Daffy Duck breaking 3 shock absorber mountings, Peter’s 2CV bending a chassis at the front and my 2CV breaking 2 rear axle mounting bolts. All were quite repairable with the spares and tools we carried. Ralph’s arc welding gear, designed to work off two 12v batteries, was invaluable and very lightweight. It was used a few times. Tyre Failures – As I recall, I had one, Ralph a couple and Greg a couple. Most of us were carrying 2 spares and extra tubes, so between all the five 2CVs we had enough spares to get us through. There are a couple of tyre depots in Coober Pedy and one would be willing to get tyres in for us for a Raid. After Coober Pedy we all went our separate ways – most people headed home, but Greg Bracegirdle and myself, in two 2CVs continued on to William Creek amd Marree to survey those roads for use in the raid and concluded that they were quite okay – reasonably good quality dirt. In Summary – I greatly enjoyed this trip and think it was quite suitable for 2CVs on a Raid and recommend that we use it as part of the Raid 2020 route. I have fairly detailed daily notes from which I intend to produce a more detailed report for the committee in due course. More surveying of the rest of the route will be undertaken later.